The Kindle is a hand held device, set to retail initially at $400. It employs e-ink, which means the light on the page comes from the environment, rather than the device itself. If you read in a dark room, the page will be dark. A bright room will make a bright page. This ambient light helps overcome the flickers that some see on a computer screen, and it also reduces the amount of energy required to power it. You page through the book by nudging a button on the side. To change from one book to another is a simple matter of clicking a button. “The idea of authorship will change and become more of a process than a product,” says Ben Vershbow, associate director of the institute. “Book clubs could meet inside of a book,” says Bob Stein, a pioneer of digital media. “The possibility of interaction will redefine authorship,” says Peter Brantley, executive director of the Digital Library Federation. I had a chance to see a demo of the Kindle last spring, although I didn’t have an opportunity to use one at length, and I am not sure how much of it has been upgraded since then. I also own a Sony Reader, which I have used a little, enough to see its weaknesses clearly. 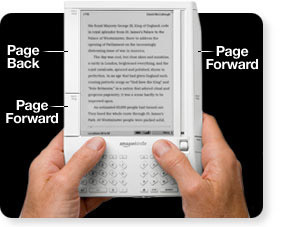 The Kindle I saw struck me as a decent working prototype that lacked the charisma of a Steve Jobs creation. No doubt it will gain some elegance as it evolves. I’m one of those folks that has no trouble reading on a screen, either the big screen of my Mac, or the smaller screen of an handheld. Books will certainly migrate there because they already are. Everything Levy, and the others (including me!) say about the future of the book I believe is true. The only question for me is, do I want to carry around another device? The immediate answer for me is: NO. Every benefit that I’ve seen the Kindle (and the Sony Reader) offers suggests to me that they could very happily live as features on that one Cloudbook device still to come. I would image that would suit Bezos fine, because as he says, the book is a service. What you read it on will not matter so much. We’ll read books on TV screens, ipod screens, iPhone screens, and Kindle screens. What will matter is that you’ll be able to live inside the book from anywhere, anytime, in all bookish dimensions. The always on book will be always actionable. This ability to interact, manipulate, shape, cut, clip, annotate, and mash up is what will keep books great.